This is a nice house in Tulsa. Nice deco features like the small porch barely covering the door and the rounded room at the front of the house contrasting with the rectangle of the rest of the structure. Great use of glass bricks maintaining privacy but still allowing the like into the house. I like the narrow window near the front door. Half the size of the windows on the upper level and the one between the sections of glass bricks. No doubt, though, my favourite part of this house is the zigzag railing on the on the raised patio along the frontof the house. Simple, clean lines. A real beauty. This sculpture in the Richelieu Garden beside the Town Hall in Calais is probably too late to be considered true Art Deco but I can see some elements in the stylisation that remind me of the deco period. 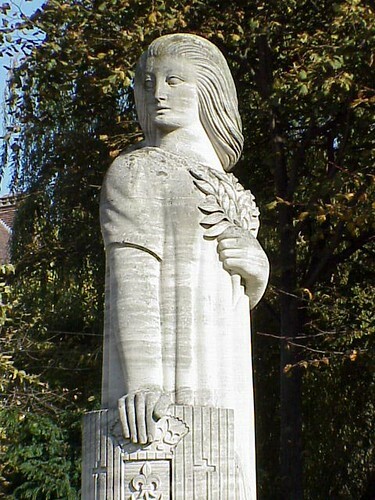 It was created by Yves de Coetlogon (1913-1973) to honour the fallen in both World Wars through the allegory of Peace. 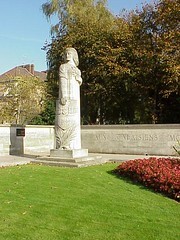 It replaced an earlier WWI monument by Moreau-Vauthier that had been extensivly damaged during WWII. Before that, Rodin's Burghers of Calais stood here until it was moved in 1924 to it's present location in front of the Town Hall. The sculpture was unveiled in 1962, 100 years after the original garden had been established. Perhaps not unexpectedly, there are a lot of memorials around this part of France as can be seen at Monuments aux morts pacifistes. When I sat down and asked myself, 'where in the deco world will I go tonight? ', my thoughts turned to Asmara. What was the name of the supermarket in Liberation Avenue? 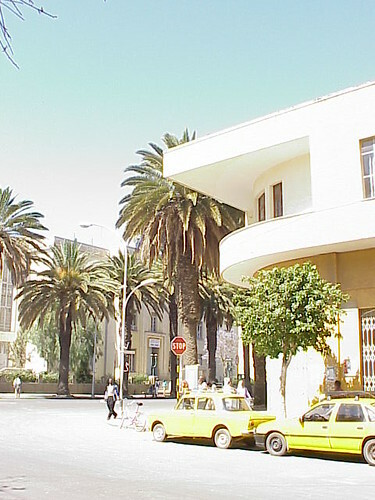 Reaching for my trustly Lonely Planet guidebook it automatically openned to the map of Asmara and I had my answer. Wikianos. Wikianos Supermarket is in one corner of a large mixed residential/commercial building which takes up a whole block. It was designed by Antonio Vitaliti and constructed in 1944. 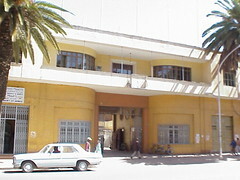 Quite late for an Italian building in Asmara. The photo above shows the driveway entrance to the inner courtyard of the building. There are massive curved walls leading off the main street which are echoed in the windows on the balcony on the second storey. To me the most interesting part of the building is the corners. 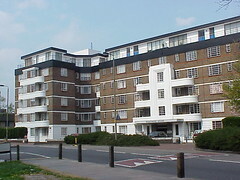 The corner balconies are rounded as opposed to the right-angled roofline which cover them. 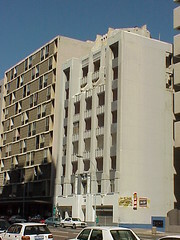 Downtown Durban has a large number of art deco buildings including this one, the Enterprise Building. 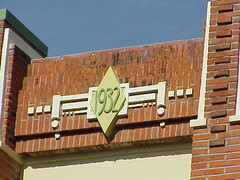 The office building was designed by A A Richie McKinley and built in 1931. Eight storeys tall, painted grey but with some amazing decoration. 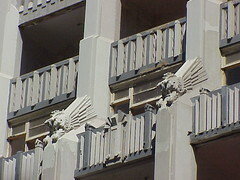 Flanking the seventh floor balcony are a pair of winged creatures. The building is not in the best of shape so it is difficult to see exactly what type of creature they might be. 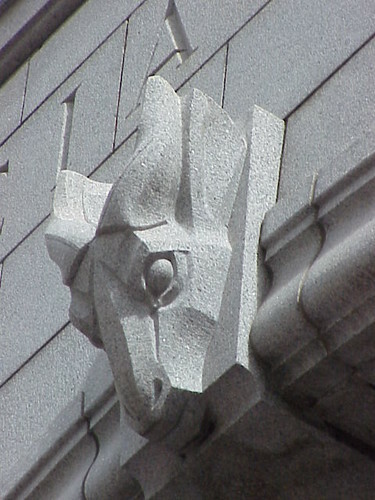 Between these creatures on the front of the balcony is a more typical geometric art deco element. Lower on the building, the decoration is in much better condition. 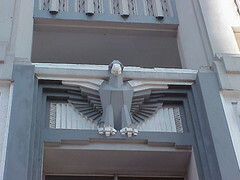 The stand-out is this stylised eagle above the main entrance. 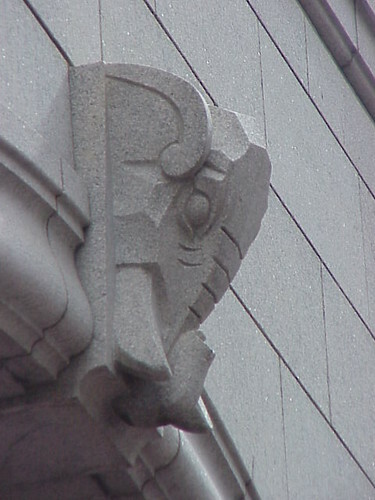 I particularily like the depiction of the birds claws, as if it is perched on the lintel. 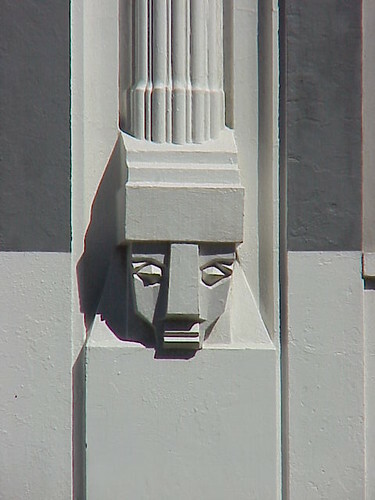 Elsewhere, near the entrance, there are a pair of Roman fasces supported by Mayan-style heads. 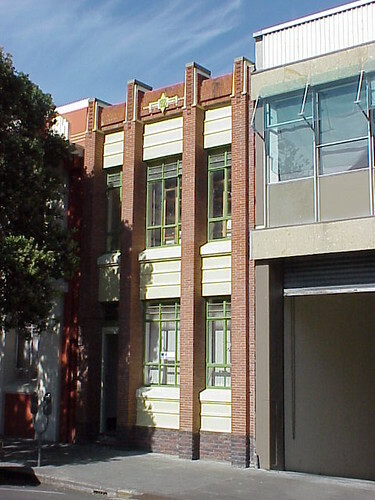 The slender red brick building is the office that Napier architect Louis Hay built for himself after his previous office was damaged in the devastating 1931 earthquake. The windows are interesting and the dark layer of bricks grounds the building but otherwise there is little or no decoration until the roofline. Centred on the building is an arrangement of lines, squares, circles and finally a diamond bearing the year 1932. 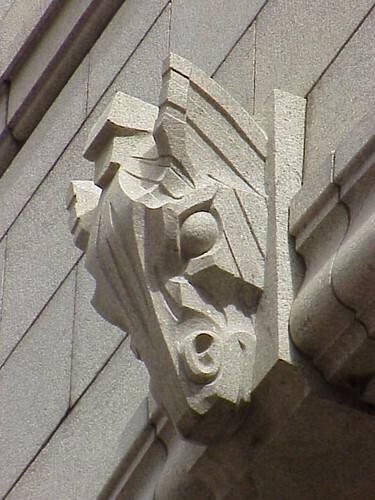 You can see these elements in various combinations in Hay's buildings all over Napier. Above this detail rows of bricks are stepped back creating subtle interest. The columns are also capped with decoration. Thin smooth rendered sections, painted a light cream or green colour, narrow the brick columns as the approach the sky. 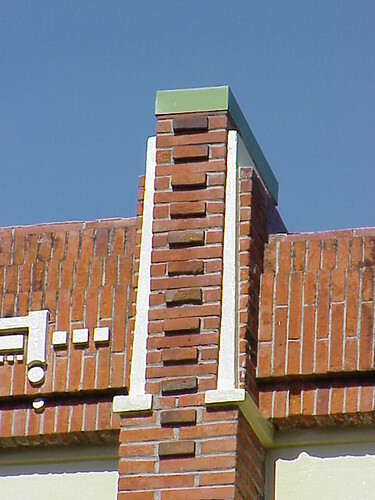 A series of twelve bricks are spaced up the column jutting out from the flat surface. The whole column is then topped with a green slab. I've written previously about a former shop in Port Melbourne that was built in deco style and here is another one, also in Port Melbourne. The use of bricks is interesting. 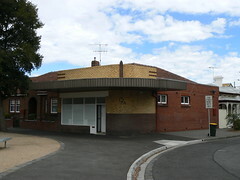 The back of the shop and attached residence are in a dark red brick, while the front of the shop has been constructed using cream bricks with dark brown used for the bottom portion of the wall and for decoration. The verandah looks new but above that there is very simple deco detailling. 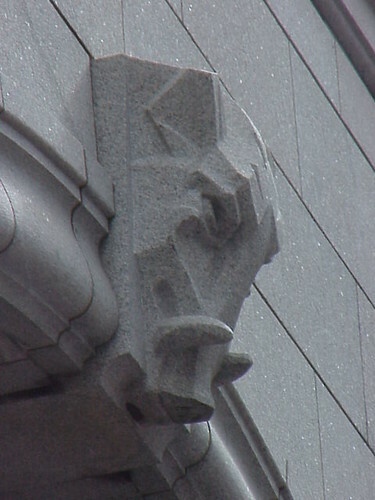 Speedlines or speed whiskers (as I learnt at Dr Matthew Martin's presentation, Streamliners, at the NGV Art Deco Symposium in June) decorate the edge of the parapet while a stepped vertical element is centered on the curved corner. 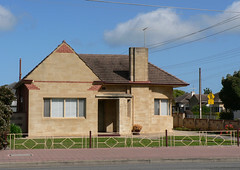 This house is in the Adelaide suburb of Glengowrie. I like porch and the rounded corner and window but most of all I like the low metal fence with the diamond motifs. In an industrial area of Richmond, quite close to where Dame Nellie Melba was born, there is a grey, non-descript single storey building. A former foundry. It has rounded corners on the walls at the loading bay entrance and may even have a simple stepped parapet, I don't recall. 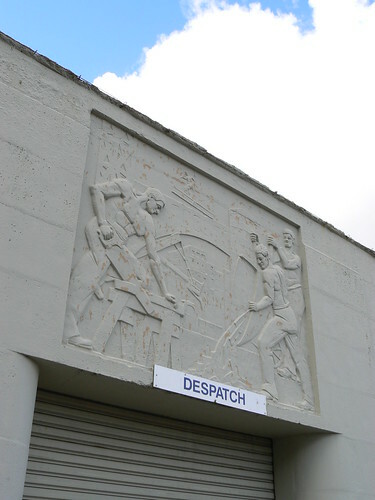 It does, however, have a wonderful frieze depicting well-muscled workers in various aspects of building construction. In the foreground, one man is sawing timber while two others empty a wheelbarrow. If you look closly at the top centre, there is also a man riding a large girder, perhaps the product of this foundry, as it is lifted into place by a crane. In the 1920s, French artist Jacques Majorelle fell in love with Marrakech, settled there and over time created this amazing garden. It contains a fantastic array of plants integrated with architectural elements. A unifying feature is the vibrant blue used throughout the garden, now called Majorelle Blue. 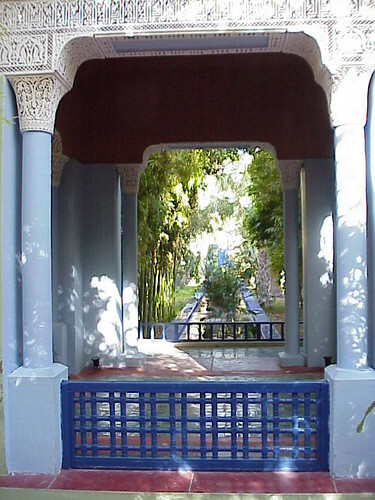 The garden were opened to the public in 1947 but after Majorelle's death in 1962 due to a car accident fell into a state of disrepair. 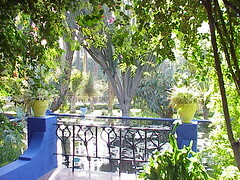 In 1980, Pierre Bergé and Yves Saint Laurent purchased the gardens and undertook major restoration work ensuring that the Jardin Majorelle would remain a quiet public oasis in the hustle and bustle of modern-day Marrakech. 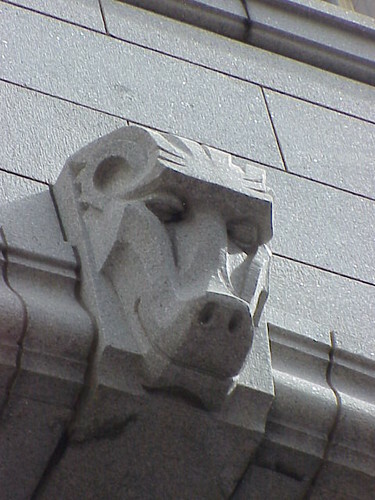 The best part about the 1940 Western Cape Legislature building in Wale St, Cape Town by architects F M Glennie and Shuurman Stekhovan are the stone carvings of animal heads. 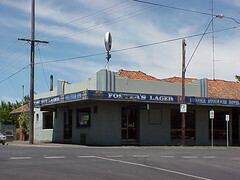 You may not be surprised to know that the Eureka Stockade Hotel in Ballarat East is close to the site of the Eureka Stockade but not that close. It is however a great little deco pub. This picture was probably taken in December 2004 when I was in Ballarat to commemorate the 150th anniversary of the miner's uprising and the taking of the stockade just before dawn on December 3rd by heavily armed troopers and police. 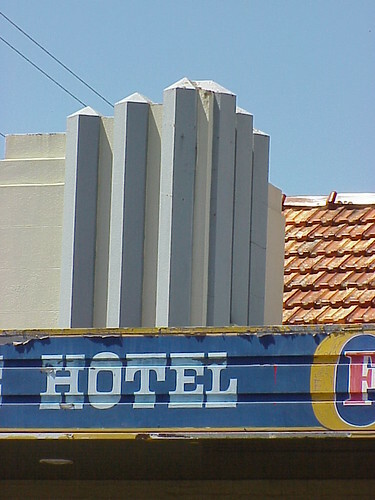 The pub looked a bit run-down then with the paint peeling from the Foster's Lager signage around the verandah but the deco parapet partially hiding the standard hip roof is pretty good. It has been painted since then and I think it looks a bit naked now. I guess Carlton & United Breweries didn't contribute towards the new paint job. Maybe it hadn't been finished because it is unusual not to have the name of the hotel prominently displayed. Maybe it is the beer-drinker in me but I do prefer the Foster's version. 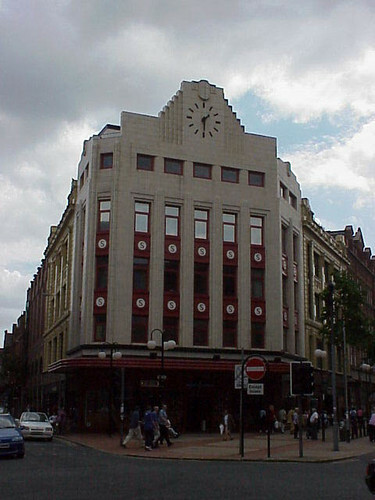 This magnificent building is the former Sinclair's Store in the centre of Belfast. 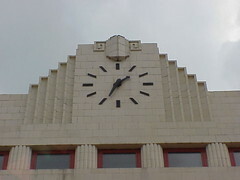 The flat facade across the corner site is dominated by this large deco clock which is stepped out and up from the parapet. 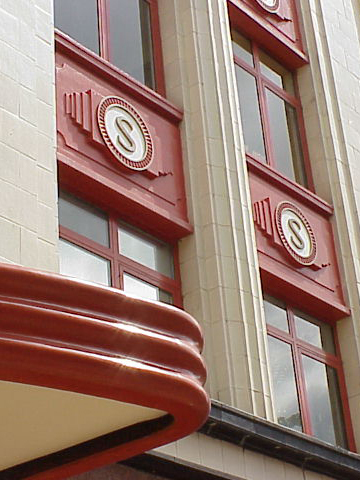 At ground level the entrance is sheltered by a large ribbed verandah while the spandrels below each window carry a deco medallion inscribed with an 'S' to denote Sinclair's, the stores owners. I wish I knew more about this building. I snapped in on a rainy afternoon in 2001 in Plymouth in the south west of England. 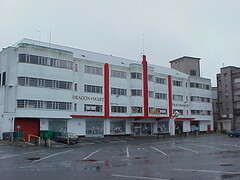 The signage reads Dragon Mart and the vertical piers and the edge of the verandah have been painted red to fit in with the east asian usage of the building. It is quite a substantial building and in a way reminds me of the Hoover Building in London, albeit stripped of most decoration. Everything about this buildings fits the rule of three. 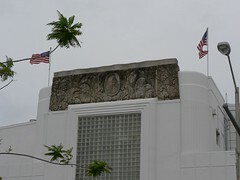 Three protruding, rounded sections, each with a flagpole. Three vertical piers, painted red. Three horizontal bands of windows. I just need three people to fill me in on it's history. I've since found out a bit more about this building through the Ask A Librarian online service and www.oldclassiccar.co.uk/garage_bartons.htm. The building was originally Barton's Garage and then at some stage became Dragon Mart and then after that Mothercare. It now appears that it has been demolished to make way for a fairly standard shopping centre. I am very happy to report that I was wrong. This building, Barton House in Colin Campbell Court has not been demolished and will feature in an interesting arts project from March 31 - April 9. 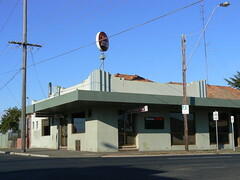 This great little theatre is on the Sir Donald Bradman Highway in Hilton, Adelaide. 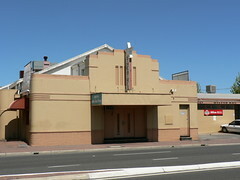 It is currently called Star Theatre One but has previously gone under other names. The deco front seems to have been added in the late 1930s to cater for the growing popularity of films. It is simple but elegant. Speedlines wrapping around the curved corners and a stepped pediment and vertical sign above the entrance. In recent decades it has returned to live entertainment with a focus on local productions. I often see interesting buildings down sidestreets and have to detour or a better look. In this case, a glimpse of an octagonal roof drew me to Bishopstone Railway Station. 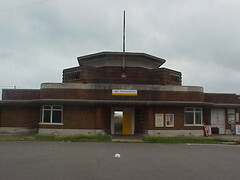 According to 74simon.co.uk, the station was opened in 1938 with the hope that the nearby village of Bishopstone would expand through the development of commuter homes to link the residential areas to the railway line. The onslaught of WWII put any such plans on hold and the station still seemed remote when I saw it. In a way it is a shame. In another place (and on a sunnier day) this would be well-known, spectacular art deco building. The building is symetrical with curved elements either side of the entrance and the main part of the structure set back with that incredible octagonal dome above the ticket hall. A flagpole marks the centre of the leading face. 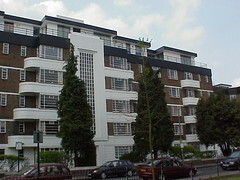 Hightrees House in Clapham is similar to many blocks of flats in central London. Often they are constructed of brick with balconies and/or entrances rendered in a contrasting colour. 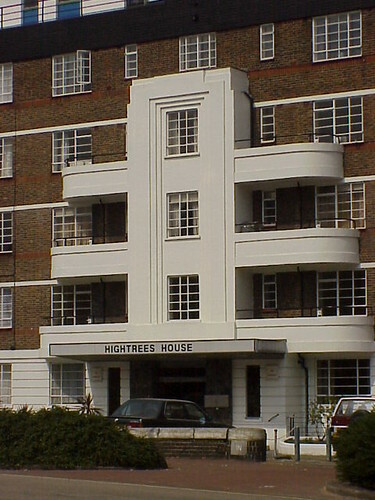 In the case of Hightrees House, the whole of the ground floor is white, as are the balconies above the main entrance and on the projecting wings. There is also a top level of white coloured buildings which could be a later addition. 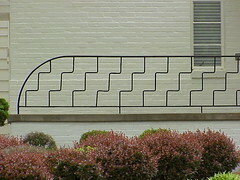 The balconies are curved at each end and taper, becoming smaller the higher they are placed on the building. 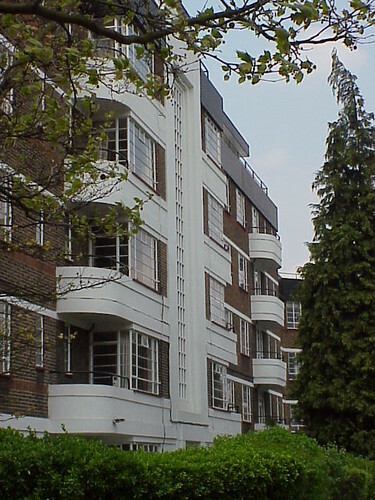 Elsewhere on the building, the balconies are more elaborate which glassed-in sections although they still taper towards the upper floors. There are also a series of small balconies which have been built at a constant width on each floor. 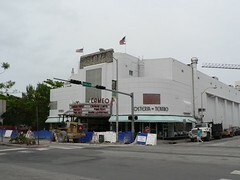 The Cameo Theatre is in the Art Deco mecca of Miami South Beach. 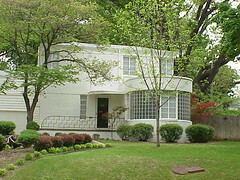 It was designed by Robert E Collins and built in 1938. The main features of the facade are the large block of glass bricks above the entrance and the panel above that with a cameo in the centre of stylised plants. 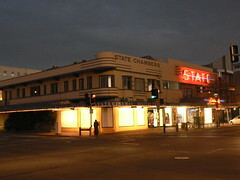 This is the State Cinema 6 complex in Nelson on the South Island of new Zealand. 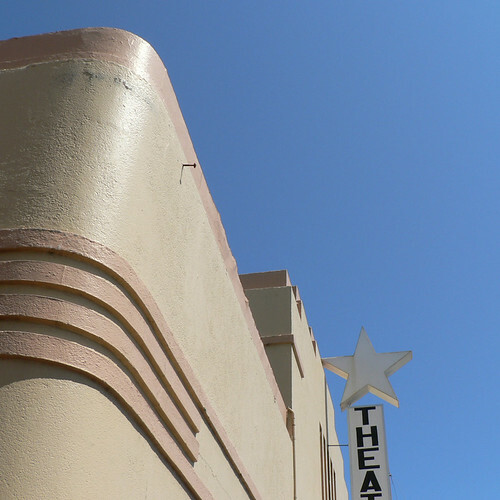 In the modern world of cinema multiplexes, I think it is great that at least some part of these great art deco buildings have been preserved and converted. Often it is just the facade and perhaps the main foyer but when the alternative is demolition like so many former cinemas then we need to appreciate what we have got. My favourite part of this building are the curved balconies on the corner. 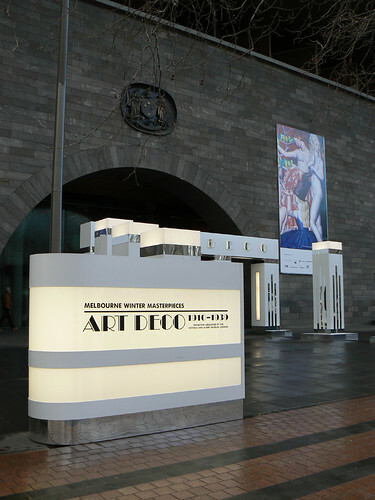 All good things come to an end and today is the final day of the Melbourne Masterpieces Exhibition - Art Deco 1910-1939 at the National Gallery of Victoria in St Kilda Road. If you are within driving distance of Melbourne and you haven't been already get there early. It is sure to be packed. Over 200,000 people have visited so far and the catalog has sold out in both hard back and soft back. So one last chance to see my pics (and others) going around with the Normandie and also in the Australian section of the show. Not to mention the fantastic deco treasures on show. I'm not going to past it up. 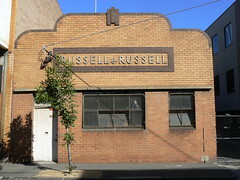 With Russell & Russell's workshop in South Melbourne, small is beautiful. 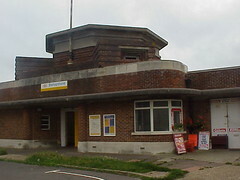 Constructed of cream bricks with a shallow concrete eyebrow over the windows and small wooden door. 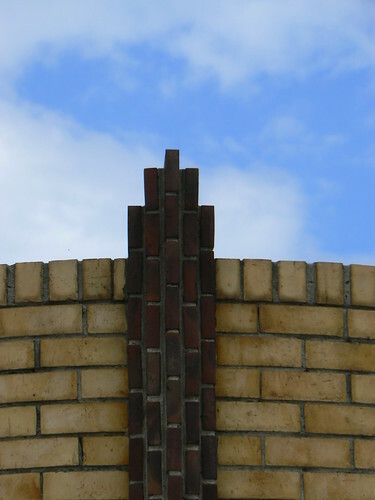 The stepped curved symetrical roofline is bordered in dark bricks as contrast. 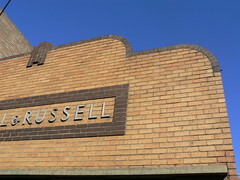 Dark bricks also provide the outline square containing the Russell & Russell name and the decorative element centered against the sky. I have been working on a very exciting project with the President of the Art Deco Society, Robin Grow, over the past few months and hopefully I can tell you more later in the year. However, the other day when I met up with him, he had a cutting advertising the 1935 Exposition Universelle et Internationale Bruxelles with a drawing of a building that I recognised immediately and answered a question I've had for about 8 years. One very dreary weekend I visited Brussels. It was grey, overcast and snowy. Snow in the mountain forests is white, pristine and dreamy. By mid-morning in the city, snow is black, mushy and unpleasant. 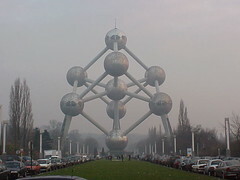 My cousin had recommended that I check out the Atomium. He had visited as a schoolboy and I hope it was better when he visited because to me it really fitted in with the dreary theme of the weekend. 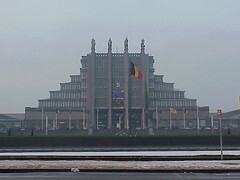 It was built for the 1958 Brussels Expo so it would have been relatively new when he saw it. Perhaps it is better now that it is 50 years old. Anyway, at the other end of the avenue was this fabulous building. I didn't know what it was and it was too cold and dreary to go and investigate so I zoomed in as far as I could and took this picture. Now, thanks to Robin, I know that it is the Palais de Expositions, or Grand Palais. It was designed for the 1935 Expo by Joseph Van Neck, was also used during the 1958 Expo and is still in use today. Back in 1935, the Exposition Universelle et Internationale Bruxelles ran from April to November and hosted about 20 million visitors. I wished I'd braved the cold and done a bit more exploring now. 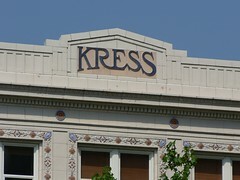 For a good part of last century, until 1981, S H Kress stores were a landmark of many American cities. 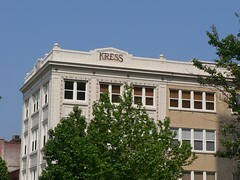 In Asheville, the former Kress store has been converted into a fine art gallery, The Kress Emporium. It is great to see a beautiful building still being used.